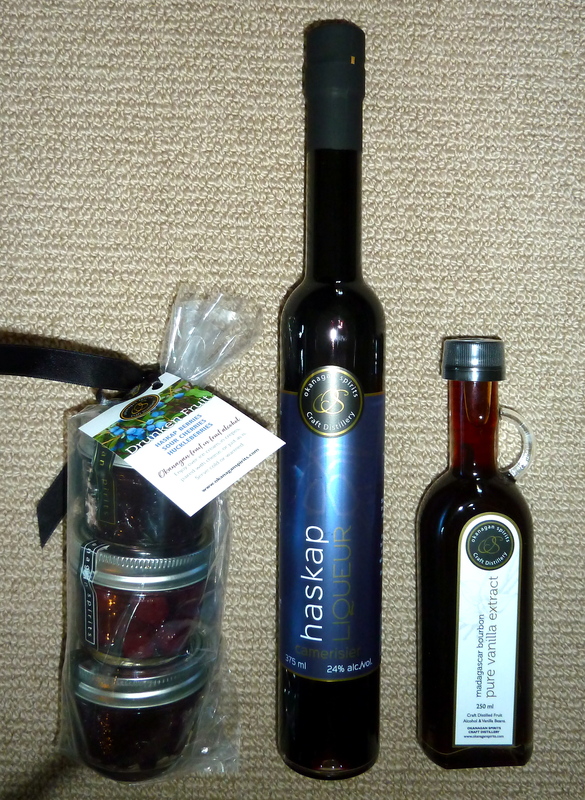 I stopped in at Okanagan Spirits last week looking for my favourite Haskap liqueur and was delighted to find a range of new products. Okanagan Spirits is a craft distillery that opened in Vernon BC in 2004 (www.okanaganspirits.com). They now operate in both Kelowna and Vernon. The range of products available shows considerable creativity and featuring of local products. This year in addition to haskap liqueur there is also huckleberry (a favourite Okanagan berry). There are jellies, drunken fruit, vinaigrettes, chutney, bourbon flavoured maple syrup and what I am eager to try in baking – Madagascar Bourbon pure vanilla extract. This is a great place for gift shopping. This visit to Okanagan Spirits made me recall past distilleries in the Okanagan. If you didn’t live in the area in the 1970s and 1980s you might not know that there was a Hiram Walker distillery that operated in Kelowna for about 25 years. Hiram Walker and Sons Limited was founded in 1858 in Ontario and became one of the largest distilled beverage companies in the world. [i] It is well-known for its Canadian Club brand whisky. In the late 1960s, Hiram Walker decided it needed a second Canadian distillery primarily to serve the prairies, British Columbia, and the developing Asian markets. Hiram Walker Ltd. invested heavily in a state of the art facility[ii] located north of the Kelowna airport. It attracted a number of other companies to the area, for example, those that supplied the glass bottles and packaging needed. The first bottling of whiskies distilled and aged entirely at the Okanagan plant happened in 1974. Peak production was in 1981 but then the interest in hard liquors dropped off as people turned to beer and wines. At the same time an economic slowdown impacted most businesses. The Company created a carbonated beverage line but sales continued to decline until 1995 when the distillery closed. The Hiram Walker buildings and properties were sold to various companies for warehouse and operating space but few traces remain of this old operation. However, there is a history and tradition of distilleries in the Okanagan. Now the times are different and Okanagan Spirits is a small family operated craft distillery with greater diversity of products. It’s interesting to watch their growth with memories of a distillery past. [i] Whitehead, Bob (2012). Hiram Walker Distillery, Okanagan History, 76th Report Okanagan Historical Society, p. 82 – 91. [ii] According to Whitehead, the cost was about $250 million in today’s dollars.